Yesterday evening, after observing the exciting ISS-Shuttle duo pass (see previous post), I tried to observe flashes from the Iridium 33 wreckage (97-051C) again. Simone had provided some experimental predictions and asked for verification. The Iridium 33 wreckage did flare: two very bright flashes (both around mag. -1) seen naked eye, and two fainter ones (+4?) found on a photograph. They were off from the experimental predictions, but still cool! 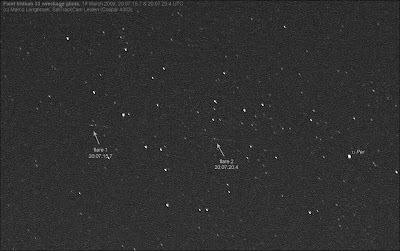 The two -1 naked eye flashed were observed at 17 March, 20:06:56 ± 1s and 20:07:02 ± 5sUTC. The two photographic fainter flashes/glints occurred at 20:07:15.7 and 20:07:20.4 UTC. The time between the latter two is 4.7 seconds, and the first two (the naked eye ones) within their timing uncertainties fit a similar 4.7 second period.